Veggie Curry at it’s best! Oooh, I am still in heaven after this delicious meal! It’s perfect for cold, grey winter days since it makes them colorful, cosy and warm! 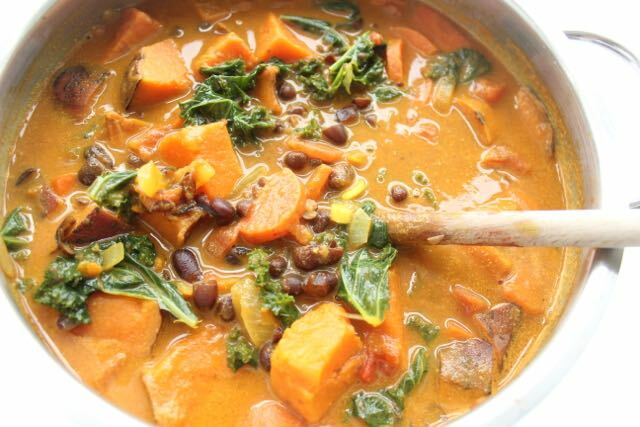 A veggie curry with sweet potatoes, adzuki beans, kale and many other healthy ingredients. Even meat lovers like it, as it is simply delicious and nothing is missing! But theoretically you can add everything you find in your fridge. Like potatoes, zucchini, spinach, chard, peas, green beans, etc., etc. serve with: rice, quinoa, millet, pasta, or whatever you like, I made this pasta. Soak adzuki beans overnight and cook for 60-90 minutes, the next day, until they are soft. Wash sweet potato, cut it into cubes and steam or boil until tender. Meanwhile, cut carrots, onion, garlic and ginger into small pieces. Melt the coconut oil in a pot, sauté the onions first, then add ginger, carrot and garlic and fry again for one minute. Deglaze with coconut milk and tomatoes and simmer over medium heat for 5-10 minutes. Meanwhile, wash kale, pluck the leaves from the stalks and add to the pot. Finally, add beans and sweet potatoes, season to taste with apple cider vinegar, turmeric, cayenne pepper, salt and pepper and let it simmer for a few more minutes. Meanwhile, cook rice or noodles. Huge curry fan over here – I’ve actually been craving it since I watched Hundred Foot Journey! 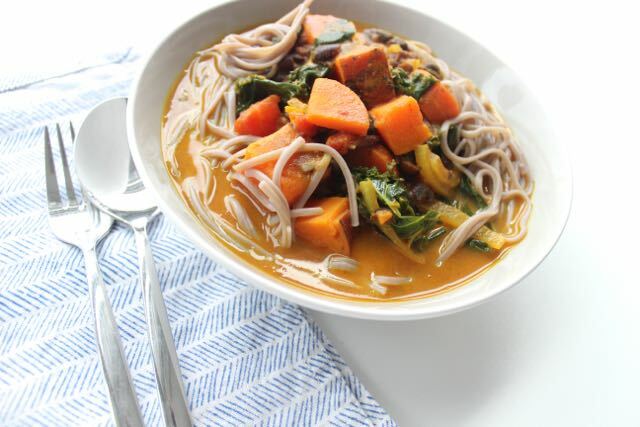 Love how hearty and nourishing this curry sounds, the perfect warming meal for a cold and grey day!